Sorry to shatter this myth, but my experience on the job as a hospice chaplain is that last, or close to last words, are often mundane or consist of expressions of discomfort. “I am thirsty.” Or “I’m dizzy.” Or, “What time is it?” Or, “Oh my stomach hurts and I have to go to the bathroom” is more likely. Or something confused, as when I gave a woman some tepid tap water and she said, “That is the most delicious thing I have ever tasted.” There may not be any words at all, of course, if the patient is unresponsive or can no longer verbalize or is unintelligible or incoherent. Perhaps we want to think literally about final words because of the unknowability of death itself; as if part of what death is all about “seeps” into the final moments of life, throwing us a clue here and there. But unlike a novel or a film, alas for us real people, loose ends are left loose, and the ending after the ending is left undisclosed. Here’s a paradox, and one that accounts for why any agreeable person would take on such work as preparing a body for burial, or in my case, serving as a hospice chaplain: being present to the dying the dead and the bereaved has intensified my sense of being alive. Just as a malevolent character in a novel can heighten the goodness of the hero, being near the dying or the dead can serve as a foil to life. Sometimes as I step outdoors after visiting a hospice patient, everything I encounter seems more firmly anchored in the here and now. Birdsong and the patter of rain make of me a rapt audience. A swaying traffic light beams out with more redness; a wind kicking up and vacillating between cool and cold bars my way from any warmer crosswinds. How can all this be happening around me while someone is about to cut loose from the moorings of her life? I stand astonished in the swirl of existence. Where does this intensity come from? The closer I am to reading the end of a piece of fiction, the more weight the sentences bear. Each succeeding word seems to take on a deeper significance. Likewise, as I am talking with someone who is nearing the end, whatever they are saying is more poignant given that backdrop. I think that is why so much is made of hearing a person’s “last words.” We assume they will be loaded with wisdom, or that they will enlighten us regarding something we had never understood about that person or about ourselves. 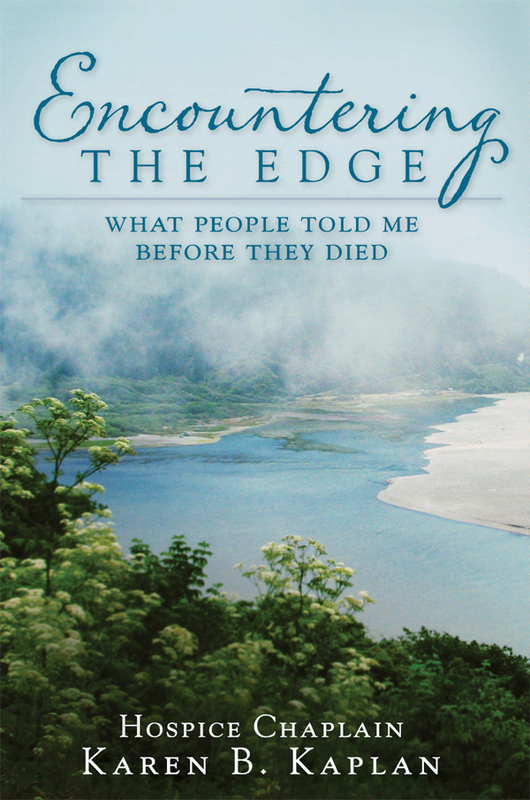 Those of us who care for the dead and the bereaved, get a continuous sneak preview of our own final crossing over the inscrutable edge between life and death. As with any rehearsal, we reap benefits that could never accrue if we were to simply improvise when the time came.